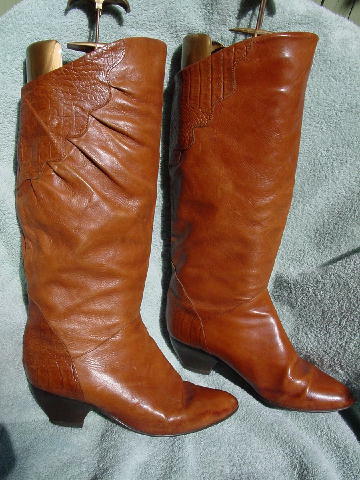 These vintage saddle tan leather boots were made in Italy. They have a faux alligator pattern on the upper back, back of the foot, and part of the top sides. The outer upper sides have a gathered effect coming from the faux alligator scalloped panel. They have curved (cowboy style) faux stacked heels which have some scrapes. There are modified rounded toes. The vamps have wrinkles and the toe areas and vamp sides have water marks. The front tops are 2" higher than the back tops. They have bone fabric linings. It's nice soft leather and detailing. They're from a young South American model. She wore them all the time. She sold them because her feet grew. 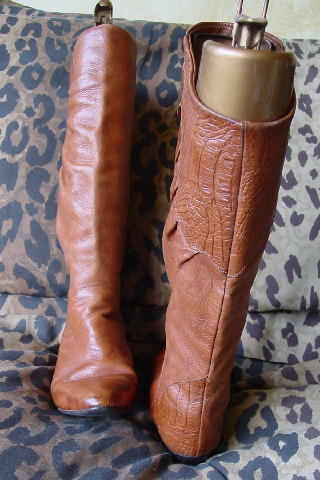 top back of boot to bottom heel 14 1/8"